CHICAGO — Andrzej Fonfara, coming off his career-best victory and on the brink of a title shot, knew he was taking a chance fighting Nathan Cleverly. Even he might not have known how much of a chance. Fonfara escaped with a bruising 12-round unanimous decision against the former light heavyweight champion, winning by scores of 116-112 twice and 115-113 before a thrilled hometown throng of 4,097 at the UIC Pavilion. The fight was also a history-maker: there were 2,524 punches thrown, and 936 landed – a CompuBox record for the light heavyweight division. “I thought I would knock him out before the fight, but during the fight, I realized he has great defense,” Fonfara said. “I had no idea he could take so many punches and still be in the fight. I realized it would be very hard to knock him out. I respect him very much. With the victory, Fonfara keeps alive hopes of a rematch with WBC light heavyweight titlist Adonis Stevenson, who outpointed him last year. “What’s next for me? Hawaii. Vacation,” he said. Unlike his dominant win against Julio Cesar Chavez Jr. in April, Fonfara, 28-3 (16 knockouts), found himself in dire straits often in this one. Cleverly, 29-3 (15 KOs), looking nothing like the Sergey Kovalev knockout victim of 2013, fought with zeal. He rocked Fonfara often, using a snapping left jab to open up his entire arsenal. Through four rounds, Fonfara’s face was beet-red from the Welshman’s relentless assault. In one sequence, Cleverly connected with a jab, a left hook and a left uppercut that froze the Chicago-based Pole. Early on, Cleverly appeared more athletic, showed a more diverse attack and was much faster. He was also staying close to Fonfara, bending at the knees and disrupting his attack – not allowing him to get off his long, straight punches. Cleverly even mocked Fonfara, infuriating his fans with several bolo punches. This was a Cleverly none of Fonfara’s fans expected to see. But things started to change in the 7th. Fonfara nailed Cleverly with two right hands near the end of the round, apparently cutting his ear and hurting him. The “Polish Prince” returned to his corner with a sense of confidence. He waited at center ring for his adversary at the start of round eight. 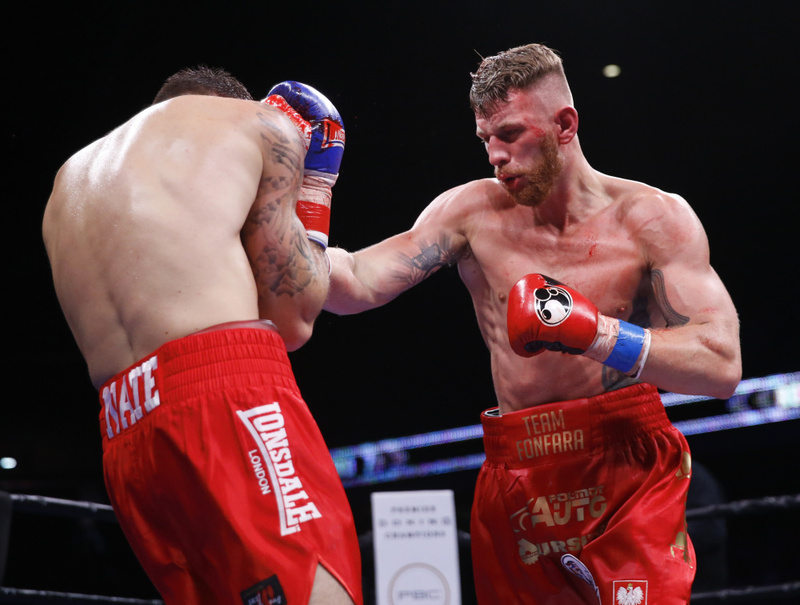 Fonfara continued to find his range in the eighth, landing hooks and uppercuts. That he remained fresh enough to launch such an attack after the abuse he absorbed over the first half of the fight was a tribute to his chin, his determination and his toughness. The crowd, sensing their man had finally cracked the Cleverly code, sang his name the rest of the way. And though Fonfara continued to march forward, Cleverly was not going away easily. His face a grotesque mask and blood covering his body, he continued to fight his fight. His punches, however, didn’t have the pop they had early on. Now it was Fonfara throwing the bolo punches. The hometown favorite ended with a flourish, attacking Cleverly at the bell. The decision could’ve gone either way. USA TODAY scored it 114-114 a draw, and two of the judges’ scores seemed particularly wide. But every round was close. At the end, both fighters were bruised and bloody and exhausted. And Fonfara knew he had earned it. Now, he can finally think of Stevenson.